The Kellogg Company was founded in 1898 when founder W. K. Kellogg and his brother, Dr. John Harvey Kellogg, accidentally flaked wheat berry—a mistake that would result in the recipe for Kellogg’s Corn Flakes. The company, which is headquartered in Battle Creek, Michigan, now operates in 180 countries, providing ready-to-eat cereals and other food products. Its 2013 reported net sales totaled $14.8 billion. Kellogg’s brands include Froot Loops, Frosted Flakes, Special K, Rice Krispies, Pop Tarts, Eggo Waffles, Nutri-Grain Bars, and of course, Kellogg’s Corn Flakes. The company keeps a close eye on its trade spend, analyzing large volumes of data and running complex simulations to predict which promotional activities will be the most effective. Kellogg had been using a traditional relational database on premises for data analysis and modeling, but by 2013, that solution was no longer keeping up with the pace of demand. Each day, Kellogg needed to run dozens of complex data simulations on things like TV ad spend, digital marketing, coupon campaigns and other promotions, sales commissions, display and shelving costs—but its system only had the capacity to run just one simulation a day. “Margins are very tight in our industry, and even slight changes in trade spend can swing market share,” McIlwain says. “Revenue growth is flat in some of our categories, so we need to be very agile to stay competitive. We needed to eliminate waste and invest more in the trade spend that drives faster time to market and greater revenue.” It was clear that Kellogg needed to move away from its traditional on-premises infrastructure. Kellogg needed a solution that could accommodate terabytes of data, scale according to infrastructure needs, and stay within its budget. The company became interested in an SAP solution called Accelerated Trade Promotion Planning, which is powered by SAP HANA, SAP’s in-memory database technology platform. Amazon Web Services (AWS) offered a fully SAP-certified HANA environment on a public cloud platform. Because SAP works on the AWS Cloud, the company knew it could achieve the speed, performance, and agility it required without making a significant investment in physical hardware. Kellogg decided to start immediately with test and development environments for its US operations. The company is now running the SAP Accelerated Trade Promotion Management (TPM) solution, powered by SAP HANA and leveraging multiple AWS instance types for both the SAP application and HANA database layers. These Amazon Elastic Compute Cloud (Amazon EC2) instances process 16 TB of sales data weekly from promotions in the US, modeling dozens of data simulations a day. The company also uses Amazon Virtual Private Cloud (Amazon VPC), which is connected directly to the Kellogg data centers to allow access to SAP TPM directly for employees who are on the company network. Amazon Simple Storage Service (Amazon S3) is used for data backups, including HANA, and Amazon Elastic Block Store (Amazon EBS) provisioned IOPS (P-IOPS) volumes for storage. The company logs events using AWS Identity and Access Management (AWS IAM). Kellogg uses Amazon CloudWatch for monitoring, which helps the company allocate costs to each department based on their individual infrastructure use. “CloudWatch helps our people make better decisions around the capacity they need, so that they can avoid waste,” McIlwain says. “We were never able to do that with our on-premises infrastructure. AWS breaks down usage and cost to such a granular level that we can identify which costs come from which department, like a toll model.” Costs and benefits of this IT service can now be aligned so that Kellogg can assess the true return on investment. For high availability, Kellogg leverages multiple AWS Availability Zones (AZs) without the additional cost of maintaining a separate datacenter. Kellogg estimates that it will save close to a million dollars in software, hardware, and maintenance over the next 5 years, just by using AWS in its test and development environments. “Using AWS saves us more than $900,000 and lets us run dozens of data simulations a day so we can reduce trade spend. It’s a win-win, and a pretty compelling business case for moving to the cloud,” McIlwain says. 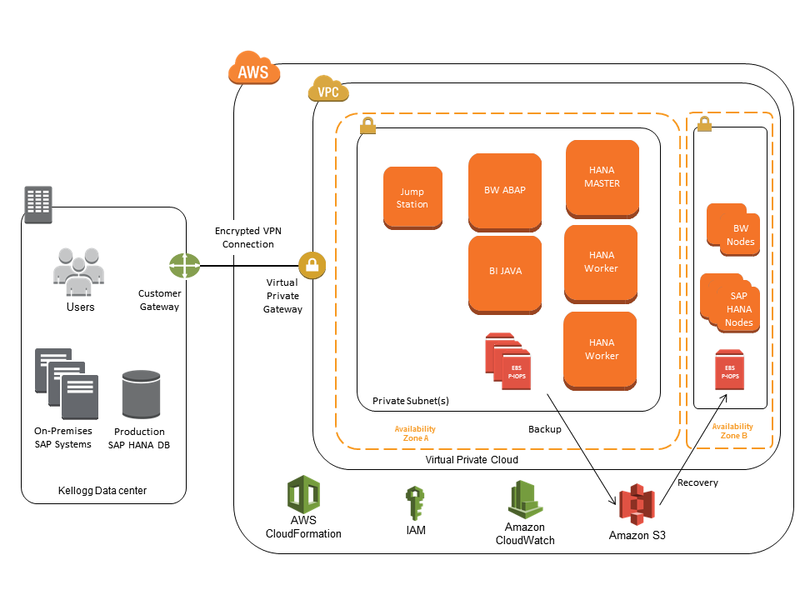 Kellogg engineers liked the accessibility and familiarity of the AWS platform, which enabled them to easily apply their existing knowledge and infrastructure skills to the AWS Cloud. In addition, by using AWS, the IT team’s internal customers can now self-fund IT projects—saving the IT team from having to budget for projects from other departments and driving more efficient use of resources. “AWS allows me to do the unprecedented: bill Sales directly for the infrastructure they’re using, instead of the hosting costs being lost in the overall Infrastructure annual budget,” McIlwain says. Kellogg is pleased that AWS supports the option to leverage existing HANA licenses that the company previously purchased from SAP; it allows the team to quickly provision instances and avoid having to repeatedly install and configure the software. Kellogg is using AWS for its US operations, and plans to expand worldwide in 2014 — which should increase the amount of data being processed from 16 TB to 50 TB. “By using AWS, we have happier customers and we work faster, cheaper, and better,” McIlwain says. To learn more about how AWS can help you run your SAP applications, visit our SAP Solutions details page.